One last Halloween post. Here is a delicious main dish type of recipe: coffin bread (棺材板). This is an actual dish originating from Tainan, Taiwan, the city my dad is from (so it seems appropriate that I should know how to make this). There, coffin bread is found served at the night markets along with all those other yummy Taiwanese dishes. So what is coffin bread? Think of it as Tainan's version of San Francisco's clam chowder in a sourdough bread bowl. 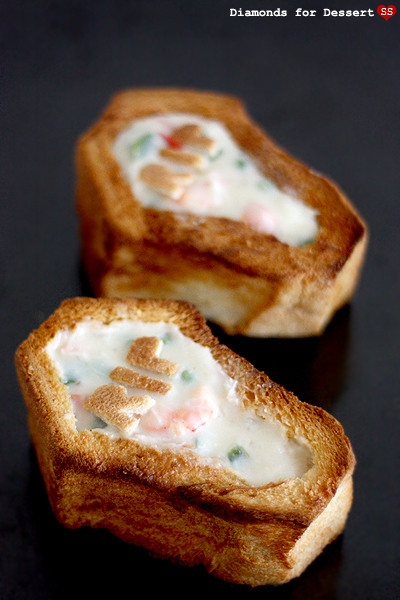 It's a crunchy golden toast "coffin" filled with a creamy seafood chowder. 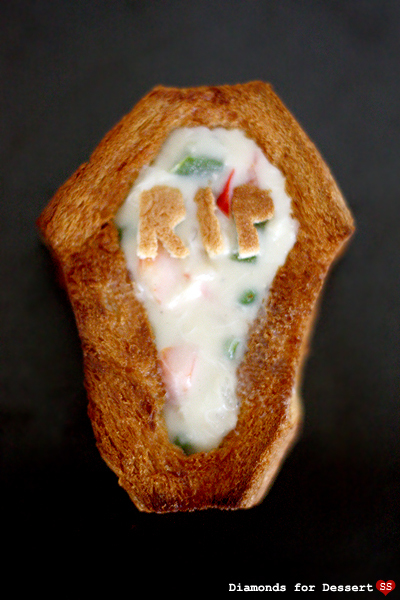 In Taiwan, the bread isn't actually coffin shaped; that's my own little Halloween twist/literal take on the name. Instead the bread is a fried, hollowed out toast block, the perfect vehicle for the hot chowder. Preheat oven to 400°F. To prepare bread, first slice each loaf into 7-inch thick slices. 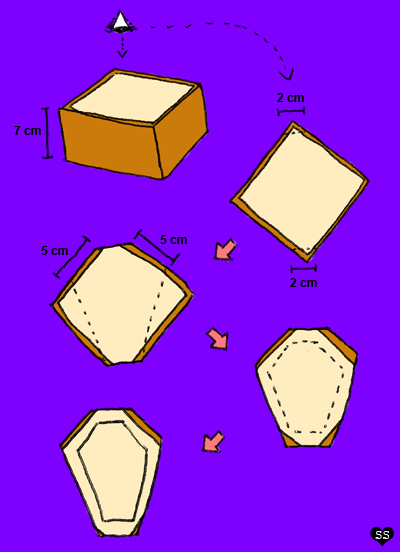 To make the toast pieces coffin shaped, follow the tutorial below (or to serve normally, just hollow out the 7-inch thick slices, leaving a 2 cm thick layer of bread at the bottom). 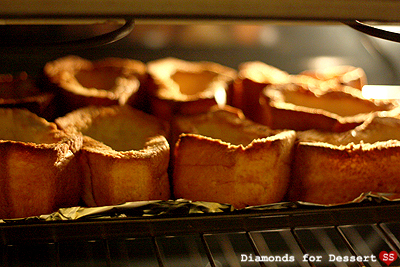 Place the bread coffins on baking sheets lined with parchment paper or nonstick spray covered foil. 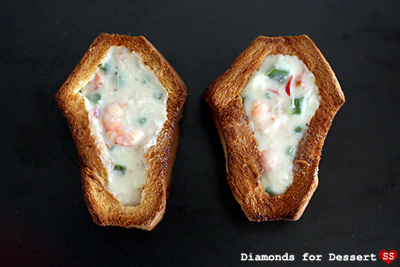 Brush the outside and inside of each coffin with the melted butter. Bake in the oven: 10 minutes with the inside facing up, 7 minutes on one side, and 5 minutes on the other side, or until all the bread is toasted and golden brown. Let cool slightly on a rack, but keep warm. 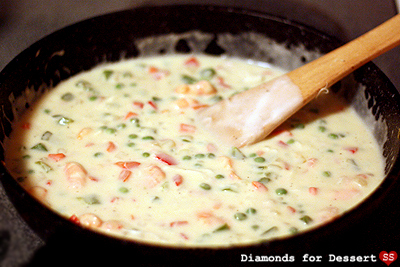 For the chowder, melt the butter in a saucepan over medium heat. Mix in the flour and cook until no longer raw. Add the milk 1/4 cup at a time, constantly whisking to prevent lumps. Continue cooking the sauce until it is thickened. Take it off the heat and set aside. Heat a pan over medium-high heat and add a bit of oil. Add the onion and cook until soft. Add the garlic, bell peppers, and carrots. Season with salt and pepper. Cook until the pepper and carrots are soft. Then mix in the peas. 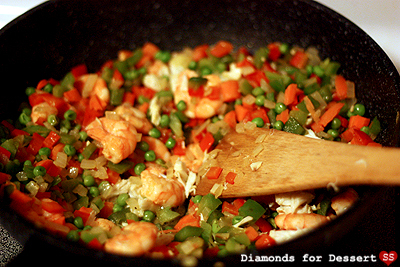 Remove the vegetables from the pan, setting them aside for the moment. Replace the pan on the heat and cook the shrimp, until pink on both sides. Once this is done, add the crab meat. Mix back in the vegetables and the sauce. Season to taste. 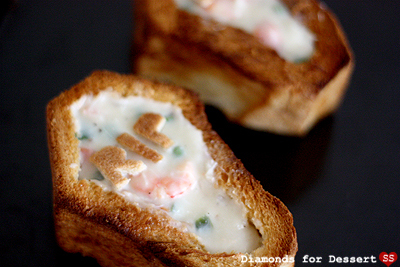 Laddle the seafood chowder into the toasted bread "coffins" and serve. 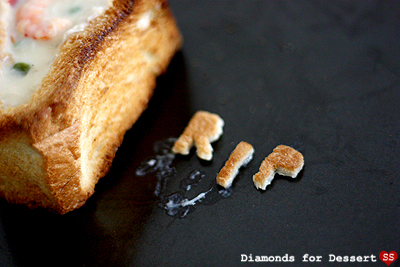 Take your 7-inch thick block of toast and look at it from the top. Turn it so that one corner is pointing at you. Then from the top and bottom corner, cut horizontally to make 2 cm sides on the top and bottom. Then from a point 5 cm down from the top right and top left sides, make a cut to the bottom right and bottom left points of the 2 cm bottom side. Then, take the knife and about 1-2 cm in from the edges, trace the outline of the bread; don't cut through the bottom of the bread (this is done so the middle can be hollowed out). Then gently hollow out the center of the bread leaving 2 cm of bread at the bottom of the coffin. If you end up tearing small holes in the sides of the coffin, just take some of the extra hollowed out bread and plug up the holes. x3baking: Thanks! Nope, I bought the bread from a bakery. I would have made it myself if I had the time and if I had a pullman pan, which sadly I don't. The bread will stay crispy after baking, without the soup, but once you add the chowder, it'll become soggy as the bread begins to soak up the liquid. So don't pour in the soup until you are ready to serve it. Okay, this is way too cute! Love this. Very cute and must've been great for Halloween! SteamyKitchen, Xiaolu, Mika: Thanks! They were perfect for Halloween, but then again, I'd eat it any day. It really is that good, hehe. Amazingly clever, and sounds good too. Bravo! You know what was so incredible? Your shrimp. Everything was delicious but I thoroughly enjoyed the plump shrimp! You really cook shrimp well! pumpkins whoopie pies blew me away btw. 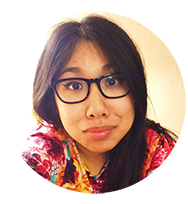 Joanna: Haha, glad you liked the shrimp. I never knew I was good at cooking shrimp; good to know :). Btw, pumpkin whoopie pie post this weekend, so check it out. I absolutely love coffin bread! I love it with plum sauce, tofu, cabbage and a bunch of other things. ^^ This looks tasty - and since its baked that makes it much better! The Coffin shape in the bread arena in simply a remarkable idea as it is really looking very delicious and attractive after the completion...I just can't resist to try it out very soon..! !